I'm pretty sure I've discussed my general lack of sewing skills and downright fear of trying new things. So, really, I don't know what I was thinking when I decided that I could make a purse. I won a free pattern from Linda at Ruffled Begonia (better known as the blog author of Craftaholics Anonymous). 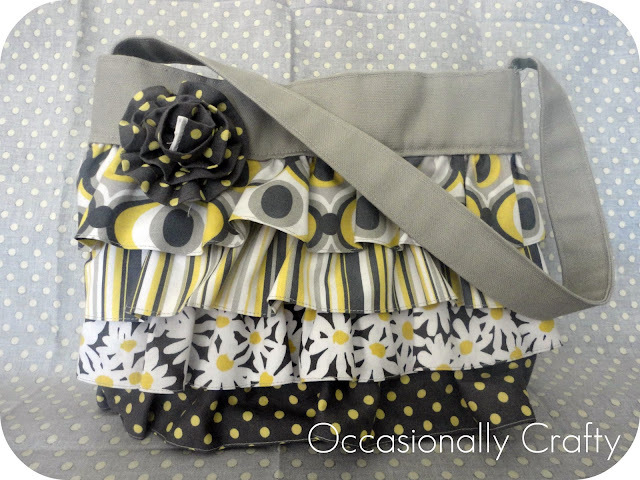 I chose the Layla Bag Pattern, which is available for purchase here. It's pretty adorable, don't you think? I decided to also be brave and order designer fabric for this project. I had a vision in my head of what I wanted this purse to be, and regular old fabric from Joann wasn't going to cut it this time. I found this Citron Gray Color Story from Michael Miller and fell in love. It took me awhile to choose which fabrics I wanted the most. It's just gorgeous. Anyway, while I waited for my fabric to arrive, I decided to test out the pattern on some scraps. I knew I would screw something up, and really didn't want to waste my "good" fabric. Does anyone else do this or I am I just totally neurotic? Anyway, I'm so glad I did, because my ruffles weren't sewed on evenly, I stitched my top strip on incorrectly, and I totally messed up the pocket (of all things). (All user error, I assure you. The pattern and directions are easy to follow). When my fabric came, I took my time and made sure to correct all my mistakes. Now, it is my second first attempt at a purse, so there are definitely some imperfections, but overall, I LOVE how it turned out. The fabrics work perfectly with the pattern. I get compliments every time I "take it out", which unfortunately, isn't often since I still usually have a toddler with me wherever I go. Thanks so much for the pattern Linda. 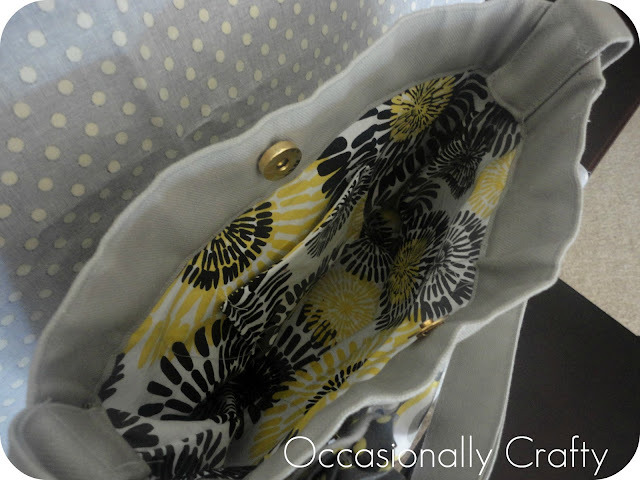 I love my purse so much I'm linking up to Purse Week over at A Lemon Squeezy Home. I'm also linking up to some of these parties. I'm pretty proud of myself for making my first purse. Now, which bag should I try next? This is so cute! I love the colors. You did a wonderful job! Nice bag...love the greys and yellows...it looks good. It's a really cute purse. I love the the grey and yellow. This is so pretty!! You did such a great job!!! @Makeup By LisaMarieThanks so much! I appreciate you stopping by my blog! @stefani Thanks so much! I'm huge into grey and yellow right now (so is everyone else I think!) Thanks for stopping by my blog! Hey that's a cute purse! It's hard to believe it's your first. 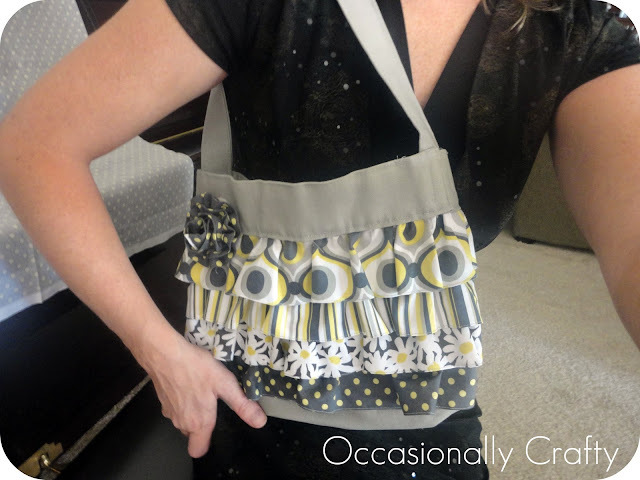 I make purses too! New follower here! I would appreciate a follow back. Thanks! You've done a great job. Love the fabric choice. @DianeDiane, thanks so much for visiting and for your kind comments. I also appreciate the follow. I'm heading over to your blog now to check it out. Good luck! 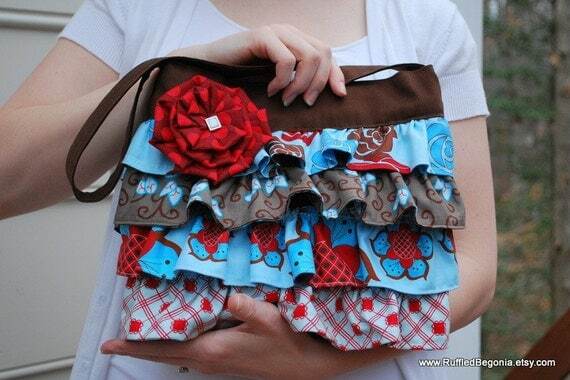 I know I'd be thinking about this the same way as you did since I've never sewn a purse before either! This turned out great- no doubt it makes you feel a little better just to carry this around :) Hope you have a great rest of the week! These are adorable. Great job on making them! I would love for you to link up with us at http://www.thesasselife.com/2011/09/link-party-5.html. we also have a giveaway going on, so come check it out. Hope to see you there. So so cute! I LOVE the fabric and colors you chose.....adorable! Thanks for sharing! Wow, that is your first purse?! It looks fabulous! Great choice in fabric, really cute! Looks great!I love that line of fabrics too. On to the next one you pro! Oh my goodness I LOVE it! I have got to learn to sew! SO pretty! I love this pattern and the colors you chose! Muy muy bonito este bolso. WOW...Amazing. very beautiful... I m going to pin it.